>Southern Belle: romanticism or revisionism? Students at the 1861 Athenaeum Girls’ School. Last night I watched a documentary on PBS called Southern Belle that depicts girls between the ages of 14 and 18 attending a sort of reenacted girls’ school in Columbia, Tennessee, in the year 1861. There is a waiting list several years long to the point of a 6 month old baby already being scheduled for a future class when she becomes a teenager. Additionally, every April, there is a condensed weekend version for ladies over the age of 19. The Columbia Athenaeum School for Young Ladies was founded by the Smiths in 1852 and for over fifty years it enjoyed a national reputation for its quality and breadth of curriculum, which offered courses in mathematics, science, and business…studies which were normally reserved only for young men. The school offered students well-equipped departments in art, music, history, science, and later on, a complete business and commercial department. The library contained over 16,000 volumes and the department of natural science held over 6,000 specimens, some of which remain and are on display. It was actually a very progressive school for the mid-nineteenth century because it was thought at that time that ladies could not learn on the same level as men. This school was experimental and cutting edge in the way it showed Tennessee and the South that they were wrong about the strength of the female mind. Today, The Athenaeum Rectory is owned by The Association for the Preservation of Tennessee Antiquities and is maintained and operated by the Maury County Chapter of the APTA as a historic house museum. In an effort to continue the outstanding heritage of the original school, two important education events are still offered. The 1861 Athenaeum Girls’ School will be conducted during the week of July 9 Young ladies leave St. John’s Episcopal Church after morning services through 15 in 2011. 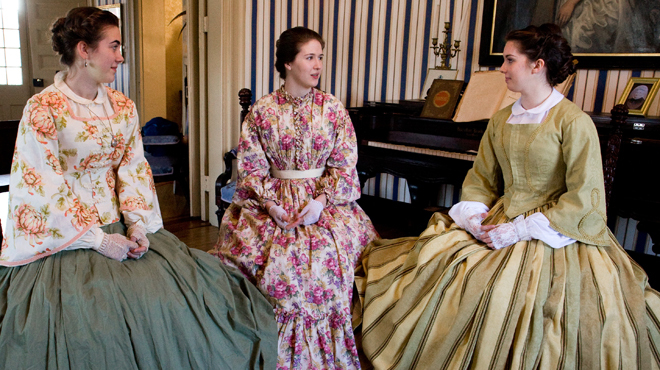 Young ladies age 14-18 come from all over the country, dressed in authentic 19th century costumes, and study the same courses in etiquette, penmanship, art, music, dance, and the social graces. In addition, they participate in side-saddle horsemanship, archery and other sports. The week is highlighted on Friday evening with graduation ceremonies followed by the formal ball to which they are escorted by members of the Jackson Cadets, a local group of young men dedicated to the study of mid-19th century history and customs. On April 29 – April 30, 2011, a condensed version of the school is offered to women of ages 19 and above. 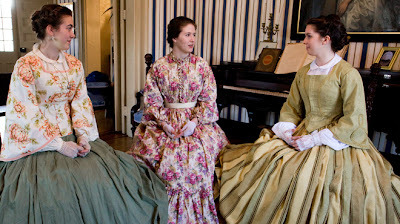 Also attired in 19th century costume, for two days the ladies participate in the same kinds of activities taught by the same qualified faculty as do the young women. Basically, a prestigious girls’ school at the highest level of education has been turned into an 1860s summer camp and PBS aired a documentary about it. Cameras followed these teenage girls as they went through their daily classes and activities, many of them having arrived with stars in their eyes about how they, “love to dress in costumes,” and, “always loved watching Gone with the Wind.” I cringed at first. If you are the slightest bit educated in mid-nineteenth century history, you know that Scarlett O’Hara is not an accurate representation of the average Southern woman. I felt a little better when the instructors repeated that Scarlett O’Hara is not to be emulated, but I noticed that even though they said that, they still taught the girls a lot of Scarlett qualities that really amount to an idealized version of the Southern lady not necessarily rooted in reality. Some of the things the girls were taught clearly came from etiquette books of the period but fail to match the women who left behind dairies of their real lives. Immediately, I noticed a mixed bag of mid-nineteenth century attire on the girls. Some looked like they stepped right out of 1861, while others looked like they were wearing cheap Halloween costumes. The matter of attire might seem trivial but we are putting it in the context of giving the girls an “authentic” experience of living in July 1861. A woman in that time used clothing as a way to express herself. While she was severely restricted under seven layers of underclothes and hoops, she could make statements with her dresses and the way she trimmed them (supposing she had the money to do so). Clothing is a vital part of understanding the 1860s woman and I felt there wasn’t enough proper instruction in that area. In fact, I saw no instruction. There was a clip of two girls trying to figure out how to get dressed and one of the girls wore a corset without a chemise. A chemise was necessary in that time because corsets were not easily washed and a chemise protected the corset from sweat and dirt from the body. By not teaching the girls why things were done that way, they’re not offering a real “authentic attire” experience. Curious, I looked at the requirements on their website and they are very lax on what the girls should wear. They give a list but no explanation of why these items were used. The teachers were not accurately dressed either. Another aspect of life in 1861 for these girls in Tennessee that went completely ignored was slavery. One of the teachers was asked why he doesn’t teach them about interaction with slaves and race relations and his response was, “We just don’t.” He couldn’t give a reason. You cannot possibly understand being a privileged girl in Tennessee without understanding slavery. They’re totally ignoring the race question at this school, which, in 21st century standards, is expected and necessary, but in 1861, it was in their faces every day. They’re also teaching these girls that slavery had nothing to do with the war. I have no desire to get into a debate about what started the war but my northern upbringing chafes at those statements. These historians articulate the other side of the issue better than I could. My issue is I can’t tell if this guy is channeling 1861 or speaking as a modern man looking back on 1861. Another historian made that point too. What you don’t see in that clip is the teacher discussing how his great-grandmother was still around when he was a child and her father was a Confederate prisoner of war. He was not allowed to even bring money into her house with Lincoln’s face on it and admitted somewhat hesitantly being raised in a certain mentality. He is three generations removed from the war and still brought up in a certain way that he whitewashes when he teaches the girls every summer. I have certain scruples about that. My biggest scruple with this girls’ school is that they’re completely ignoring the academic education that the real girls in the nineteenth century received. To me, it sort of undermines the memory of those girls and how hard they had to work for their education. Remember, those girls were not supposed to be educated and men were turned off by such women. They were going against the grain. They were pioneers. The girls attending the school in the summer now should have more exposure to the academic education their foremothers received in order to really see what they endured and how hard they worked to better themselves. They should be taught more than the idealistic image of a Southern woman. Real Southern women have a long history of being stronger than people expected, resourceful, loving, tough, ladylike, yet still highly clever and intelligent. Yes, there were rules in society and they strove to reach the perfect image of a Victorian woman but they also had their feet firmly planted on the ground and did whatever was necessary to survive. The docile, sweet, perfectly submissive Melanie Hamilton idea of Southern women seems as inaccurate to me as the overly opinionated, vivacious, conniving Scarlett O’Hara idea of Southern women. I don’t think you can categorize Southern women at all. They were and are all individuals. Sweeping aside my criticisms of how the 1861 Athenaeum Girls’ School is operated today, I do see some positive things. I do think girls at that age in their teenage years should be taught things that are becoming lost in the development of technology and changing gender roles. I do agree that womens’ rights do not have to mean a woman no longer should be feminine if that’s what she wants for herself. To me, womens’ rights gave women the choice to be whatever their hearts desire, even if that is an old-fashioned housewife. The girls at this school are taught manners, etiquette, art of conversation, how to write letters, etc. All of these things, while being taught in 1861 context, are still very applicable in the 21st century context. I also think this is a good way for like-minded girls to meet each other and become friends since they would certainly not have met in other circumstances. I will readily admit that I was not born and raised in the South, so I’m not likely to really understand the Lost Cause mentality that certain places like this school embrace. It’s all about perspective. If I was raised amongst those ideas, I would probably be lying about my age and bribing people to let me into that school. Things being as they are though, I’m not entirely sure that I would send my daughter there even if it is just a summer camp. I think I would actually have to go there and see it for myself. Southern girls who love history and their heritage will certainly jump at the chance to attend this summer camp. The thought did cross my mind, though, how fun it would be to run a similar summer camp from the northern perspective. There should be an alternative for the other side. >I haven't had a chance to see it yet, but that sounds pretty much like what I was expecting.